On my scorecard I’d circled the bases-loaded end of the Bulls’ 1st inning and base-loaded end of 2nd inning and made a note to myself, “That doesn’t look good.” In the end, it didn’t matter. In the RailRiders’ 5th a flurry of “ground balls with eyes" pretty much ripped up my scoresheet. And then the was the 9, count ‘em, 9 walks by the relief corps (10 walks on the night, the worst performance this year). Aaaaaargh! Go home. Tomorrow’s another day. There’s something not right about Jordan Norberto. In his last two appearances he’s gone 2.1 innings, given up 6 hits, 8 walks, 4 earned runs on a lot of pitches (89). He did escape the 5th after walking the bases loaded. But the 6th was simply awful and painful to watch (I left near the end of it): single, single, single (run scores), walk, ground out (run scores), fly out, walk, walk (run scores). Bryce Stowell comes in. But, even Stowell, a very reliable guy, gave up four walks and a run. Ah, but today’s another day. Regular television broadcasts start today. For the rest of the season’s home games you will be able to watch the superb Explorer Post 50 crew’s work. Time Warner Cable 323 or 1250. Over the air 50.2. Details and schedule here. The Herald-Sun is reporting that Jake McGee has finished his rehab and is going back to the Rays. And that Matt Andriese is coming back to the Bulls. I find Andriese’s return a bit odd since he picked up a 4-inning save against the Yankees last night. In the same article rehabbing Nick Franklin states that he thinks he’s ready to go back. 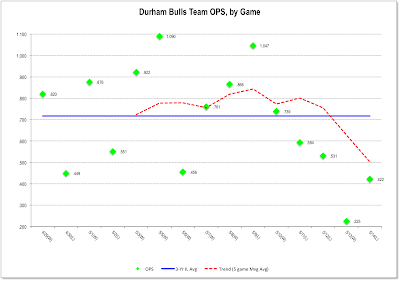 When we looked at hitting a couple of weeks ago, the hitters were on a slight upward trend. Not so at the moment. The last four games have been well below average. The quirk is that the hitters’ worst game (May 13) was a win. 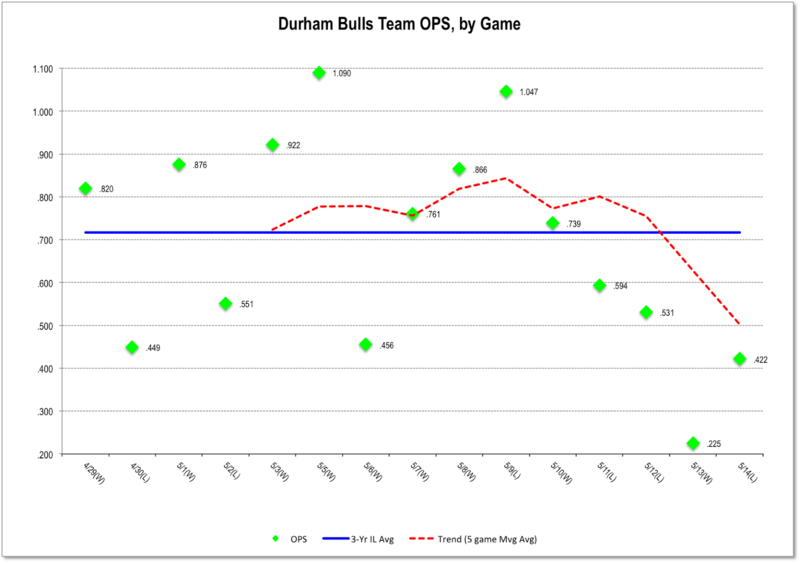 This charts the team OPS (on base percentage + slugging) for each of last 15 games. The blue line is the average OPS for international league teams over the last three years. The trend line is a five-game moving average.